Special Features include a Making-of Featurette and a Q&A and Commentary with the Cast and Director! CULVER CITY, Calif. (Dec. 14, 2015) – GRANDMA, the refreshingly unapologetic and candid film navigating the intricacies of relationships between three generations of women, arrives on Blu-ray™, DVD & Digital February 9 from Sony Pictures Home Entertainment. 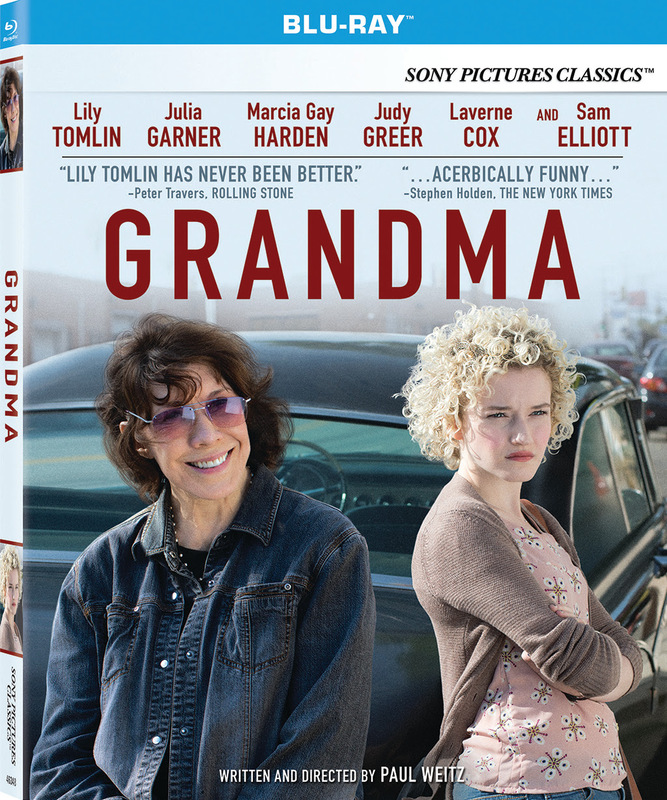 This critically acclaimed Sony Pictures Classics film, written and directed by Academy Award® nominee Paul Weitz (About a Boy), brings Lily Tomlin (“Grace and Frankie”), back to the big screen as a leading lady in this humorous portrayal of feisty grandma Elle Reid. Tomlin’s portrayal in the film earned her a Golden Globe® nomination for Best Actress in a Motion Picture, Comedy. Rounding out the talented ensemble cast are Julia Garner (The Perks of Being a Wallflower), Marcia Gay Harden (“Code Black”), Judy Greer (“Married”), Laverne Cox (“Orange is the New Black”) and the timeless Sam Elliott (“Justified”). The Blu-ray, DVD & Digital releases of GRANDMA will include “A Family Portrait: The Making of Grandma,” and a Q&A with Lily Tomlin, Sam Elliott, and director Paul Weitz.